Turun seudun puhdistamo Oy is a wastewater treatment service provider that is owned by 14 municipalities and offers high-quality wastewater treatment services to its owners. The company is responsible for the operation and treatment results of the Kakolanmäki wastewater treatment plant, with the aim of providing an optimal purification performance. The plant processes the wastewater of almost 300,000 residents in the Turku region, in addition to the industrial wastewater of the region. Turun seudun puhdistamo Oy commenced its production operations at the beginning of 2009. The Kakolanmäki wastewater treatment plant processes all of the municipal wastewater produced in the Turku region. If you have any questions regarding wastewater treatment operations in your area, please contact the wastewater treatment service provider of your municipality. The map of western Finland below shows the area of operation of Turun seudun puhdistamo Oy. The map also shows municipalities whose prospects for joining the company’s area of operation are currently under review. The hygienic conditions of the sea areas surrounding Turku underwent a significant change between 2008 and 2011. 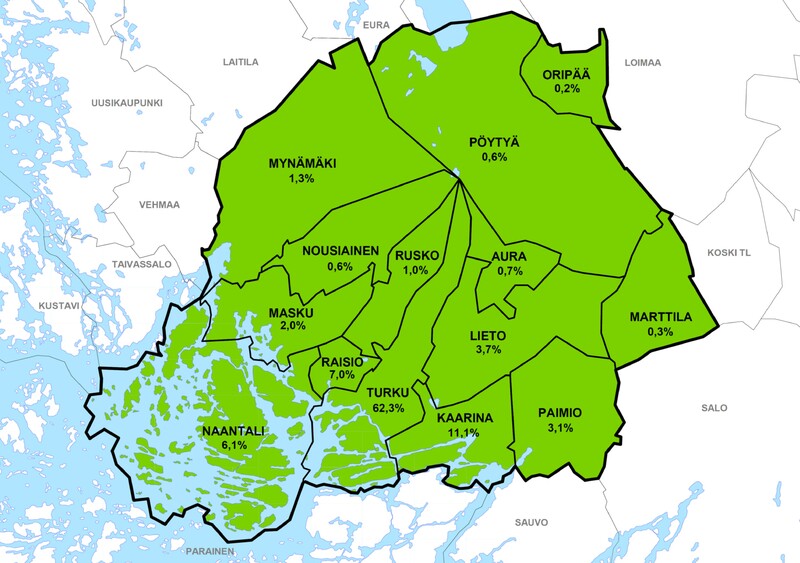 A study carried out in 2008 concluded that the hygienic quality of the discharge areas of the Raisio, Turku and Kaarina wastewater treatment plants’ was poor and that the quality of the surrounding areas was passable. When another study was carried out in 2011, the state of the sea areas had improved considerably. In the discharge area of the Kakolanmäki wastewater treatment plant, the hygienic quality of the sea was poor, while in the surrounding areas, the quality was good. In the discharge areas of the wastewater treatment plants of Raisio and Kaarina, wastewater no longer had a discernible effect on the hygienic quality of the sea. During its operation, the Kakolanmäki wastewater treatment plant has met all of the requirements of its environmental permit regarding concentrations and treatment efficiency. According to Turun Seudun Puhdistamo Oy’s strategy, the plant aims for better results than those required by the environmental permit. So far, this goal has been met. The Kakolanmäki wastewater treatment plant is a 4-lane wastewater treatment plant, based on mechanical, chemical and biological treatment processes. The purification process is very efficient: the plant removes up to 99% of organic matter, phosphorous and solids (requirement 95%) and 79% of nitrogen (requirement 70%) from processed water. Wastewater enters the plant’s intake pumping station, via tunnels from two different directions. From the intake pumping station, the water is led to screening and sand separation, where coarse matter is mechanically removed from the water. In order to facilitate the treatment process, air is also added to the wastewater during sand separation, since wastewater usually becomes anoxic as it passes through sewers. Before moving on to the primary clarification phase, a chemical is added to the water, in order to remove phosphorous. In primary clarification, some of the solids in the water are removed by allowing them to settle at the bottom of the treatment basin. These solids contain high amounts of phosphorous. The raw mixed sludge that is collected into the clarification basin’s sludge pockets during the clarification process is pumped out to an intermediate storage and then onwards to sludge centrifugation. In the aeration phase, microbes are used to remove organic matter and nitrogen from the water. Different microbes are used to remove different substances, and each microbe requires specific conditions, which is why the water passes though both aerobic and anaerobic compartments during the aeration process. In the aerobic compartments, air is injected into the water from the bottom of the basin, while in the anaerobic compartments, the wastewater is mixed with large mixers. Nitrogen is removed in both aerobic and anaerobic compartments, while organic matter is only removed in aerobic conditions. In the secondary clarification phase, the microbe mass that is mixed in with the wastewater during aeration is removed by allowing it to settle at the bottom of the treatment basin. Most of the phosphorous in the wastewater is also removed through this settled sludge, while the now clear water moves on to the next stage of the purification process. The removed sludge is conducted as return sludge back to the aeration phase, where surplus sludge is removed from the process by way of primary clarification. The final stage of the treatment process is sand filtration, where the water is filtered through a layer of sand. In order to increase the reliability of the process, the plant also utilises a two-line by-pass water treatment unit, which is used during peak flow times to chemically process wastewater after it has passed through primary clarification. Once the plant’s treatment process is complete, the purified water is discharged into the Linnanaukko harbour basin in Turku. The sludge that is removed from wastewater during the treatment process is dried using centrifuges and stored in silos. The centrifugation that takes place at the plant is only a small part of the overall sludge treatment process. The dried sludge is transported by tank trucks to Gasum Oy’s biogas plant at the Topinoja waste treatment centre, where the actual sludge processing takes place, using anaerobic digestion and post-composting. The Kakolanmäki wastewater treatment plant also features a heat pumping station. Oy Turku Energia uses the heat pumping station to extract some of the thermal energy from the wastewater to produce heat for district heating purposes. The water that is cooled down by the pumping station is also used for district cooling.